Bring a true Farmhouse feel with the Sawyer Mill Charcoal Panel Set & attached Valance. Love the textured, khaki cotton chambray, lined with white cotton. 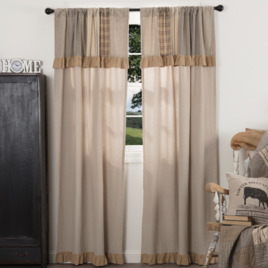 Valance is detailed with vertical strips of ash grey, creme, and black plaid & striped fabrics.